Pro Yakyuu Team o Tsukurou! 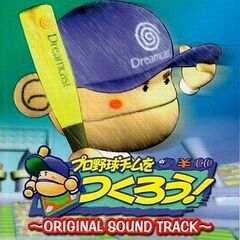 : Original Sound Track (プロ野球チームをつくろう！　オリジナル・サウンドトラック) is an album containing music from the Sega Dreamcast game, Pro Yakyuu Team o Tsukurou! and its Sega Saturn predecessor, Pro Yakyuu Team mo Tsukurou! EN: Let's Make! Let's Make! EN: Where Did He Go? EN: What are You Buying? What are You Making? EN: What a Beautiful Day! EN: You Did It, Congratulations!! EN: Let's Go to the Ballpark!